I’m not going to sugar coat it, I’m really not the best when it comes to adjusting from summer to winter. Spring is my absolute favourite time of year and it’s those light early mornings and the feeling of warmth that I really miss. This year I’ve been working on changing my whole mindset, I don’t want to be wishing the days away until late March when we finally creep into longer days, I want to feel good regardless. Self care is something I’ve always been passionate about. I remember studying positive psychology at university and the main message was that being kind to yourself is actually the opposite of selfish, as you’re able to help others when you’re feeling your best, and I absolutely agree. The first thing I started doing at the beginning of October when the days were really starting to feel shorter was going for as many walks as possible. I basically try to get out of the house or indoors when I can, and although it’s starting to get chilly the fresh air really does make me feel good. On a Sunday morning when Jay and I are both at home we’ve started going for an hour long walk in a local park, I honestly feel like this boosts my mood and helps me feel good for the day. Plus it’s a nice way for us to both catch up without any distractions. I envy people who have a dog (not only because we’re absolutely desperate for one) because it’s the perfect excuse to get out and walk more. The next thing is a more recent addition to my daily routine, I’m just over a week into using a Lumie Light. One of the biggest things for me is how hard it is to get up in the mornings when it’s so dark, I don’t feel refreshed or energised even though I’m getting a good eight hours sleep! 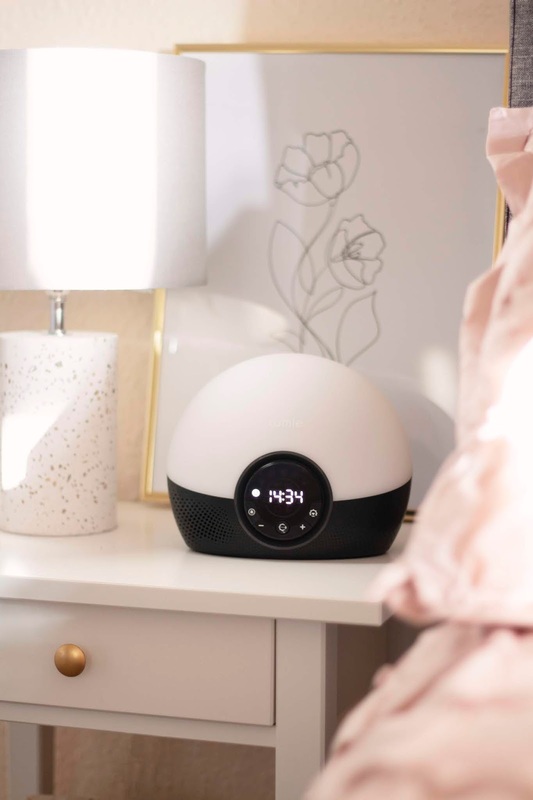 The Lumie Light Bodyclock Glow 150 has changed this straight away, it mimics the sunrise and sunset so when we wake up in the morning the room is filled with light which makes it so much easier to get out of bed and feel refreshed. I could waffle on about this for an entire post, so if you want an update in a month or so then let me know, I just cannot recommend it enough if you struggle with the transition into winter. It’s also an alarm clock and has sleep/ wake sounds, I don’t have my phone by my bed anymore for the alarm which is also nice as I’ve got out of the habit of scrolling through social media just before I go to bed and as soon as I wake up. Something else that’s really helped me feel good is having more pamper sessions and looking after my skin on a daily basis. 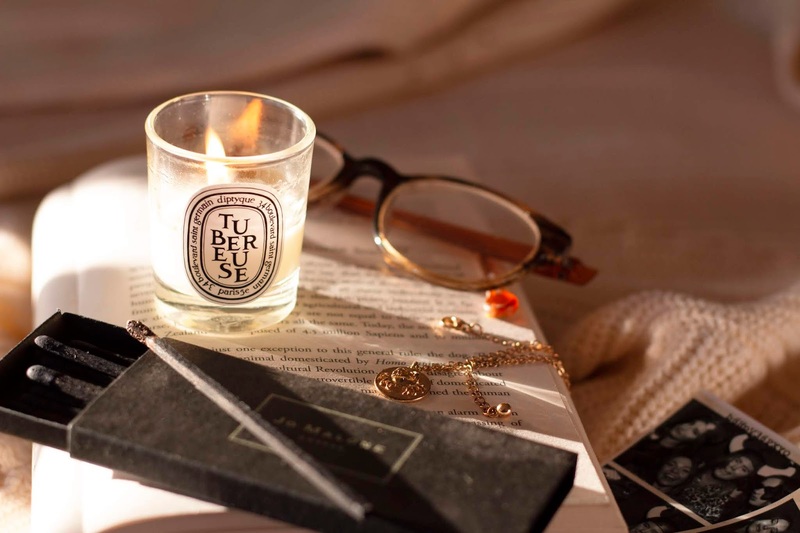 I’ve been burning my favourite candles, using face masks and spending time to make my home and bathroom feel clean and cosy which makes all the difference. 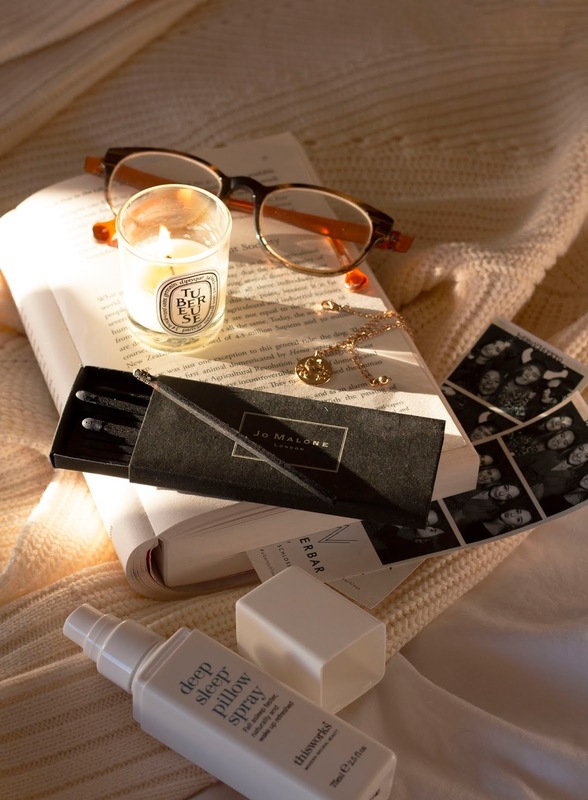 I have just published my Winter Evening Skincare Picks and I have been religiously spending more time on my skin both morning and night to try and combat the dehydration. 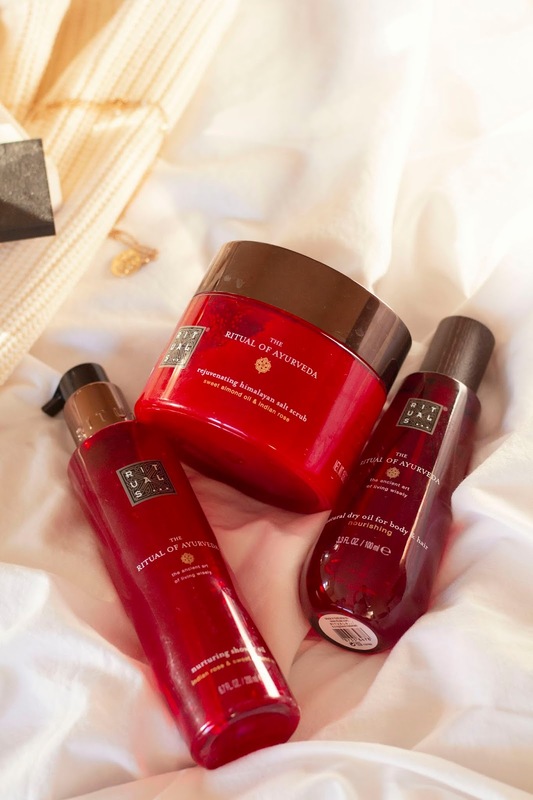 The rest of my body also feels dry without taking care out it, I’ve been using the Rituals Ayurveda collection which feels so luxurious (my favourite thing from the collection is the foaming shower gel, this was in the shower when I took these photos). The scent for the collection is sweet almond oil and indian rose, it’s really warming and makes the 6am showers so much more bearable. I’ve noticed I’m much more sociable in the summer months and I’ve been determined to carry that into the winter. I’m making more of an effort to keep intouch with family and friends which honestly feels so good, even if it’s taking an hour out of my evening to FaceTime it’s always worth it. Don’t get me wrong, I’m all for the hygge notion, but I do think that needs to be balanced with spending time with loved ones and actually doing things in the evenings and weekends too. The last thing is something I’ve neglected this year, but I know exercise is one of the main things that makes me feel good. Rewind to my teenage days and I would do everything I could to avoid exercise, I haven’t always enjoyed it and even now it’s still hard to get into a proper routine. I tend to go to the gym only a couple of times week straight from work (leaving the warm house to drive to the gym at 7pm rarely happens). Thinking about how good I feel after exercise is what motivates me to go. My husband worked away all over Christmas and winter last year and I got into the routine of going to the gym most days in the run up to our wedding, this definitely saved me from feeling rubbish over winter and gave me something positive to focus on. It’s not been easy moving into the cold months, but looking after myself and sticking with these things is already making me feel noticeable more positive and has definitely made a difference. "The Ultimate Christmas Gift Guide For Her." Thanks Lauren, the fresh air does just make you feel amazing does it!